Force feeding won’t work even on a hungry brain. A few thousand years ago, in 360 B.C., Plato advised against force-feeding of facts to students. "Elements of instruction...should be presented to the mind in childhood; not, however, under any notion of forcing education. A freeman ought not to be a slave in the acquisition of knowledge of any kind. Bodily exercise, when compulsory, does no harm to the body; but knowledge which is acquired under compulsion obtains no hold on the mind." We now have neuroscience of learning research to support these recommendations to avoid forced instruction and provide children with the best environment and experiences for joyful learning. We have come to literally see how stress and curiosity edits which sensory information is given entry to our neural networks and where the input ends up. Social, emotional, hormonal, and nutritional influences are overtaking the attribution of intelligence to primarily genetic factors. Microbiology research reveals that emotions and experiences turn on or off portions of genes that determine how that gene will be expressed. Neuroplasticity research reveals that intelligence can be changed and guides us to educational and parenting strategies are neuro-logical to promote positive changes. Those are topics that will be in future posts here and are addressed in articles on my website www.RADTeach.com . In this post, combining my background as a neurologist and classroom teacher, I'll share my strategies to help parents and teachers get information "admitted" through brain's attention system. The brain evolved to promote the survival of the animal and the species. That means giving priority to potential threat. Every second, of the millions of bits of sensory information from the eyes, ears, internal organs, skin, muscles, taste and smell receptors that are at the entry gate, only a few thousand make the cut. The system that determines what gets in—what the brain attends to is the Reticular Activating System or RAS. This primitive network of cells in the lower brainstem, through which all sensory input must pass to reach any higher regions of the brain, is essentially the same in your dog, cat, child, and you. The RAS favors intake of sights, sounds, smells, and tactile sensations that are most critical to survival of the animal and species. 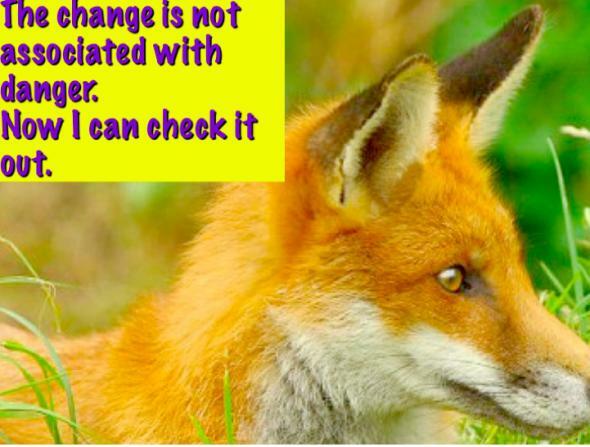 Priority goes to CHANGES in an animal or human's environment with priority to change appraised as threatening. When threat is perceived, the RAS automatically selects related sensory input and directs it to the lower brain where the involuntary response is not to think, but to react—fight, flight, or freeze. When children's brains perceive threat (punishment or embarrassment in front of classmates for not doing homework, fear that they will be picked last for a kickball game, or anxiety that they will make an obvious error because they are not fluent in English) the RAS lets in only what is perceived as relevant to the threat. Unless the perception of threat is reduced, the brain persists in doing its primary job—protecting the human or animal from harm. The neural activity on scans during fear, sadness, anger or other stressful emotions is evident in the lower brain. In this stressed state "attention" is not under our control and the brain activity on scans drops way down in the prefrontal cortex. That higher, reflective, cognitive region of the brain does not receive the sensory input determined irrelevant to survival. The day's lesson does fall on deaf ears. When students are criticized for not paying attention to the lesson it doesn't mean they are inattentive. Their RAS is paying attention to (letting in) sensory input, just not the sensory input their teachers think in important. One of the great gifts of neuroimaging research is information about which sensory input gets through the RAS when threat is not perceived. When not under high stress alert, the RAS is particularly receptive to novelty and change that arouse curiosity. That is the key to the gate—the brain seeks input about the new, the unexpected, the colorful, musical, moving, aromatic sensations that are available when perceived or imagined threat is not blocking the way. When students are curious about something, they seek an explanation. This motivates them to persevere in seeking the information they now WANT to learn, what they need to be taught. Knowing about the RAS means we can promote classroom communities where students feel safe, where they can count of the adults in charge to enforce the rules that protect their bodies, property, and feelings from classmates whom they perceive as threats to these things. Our increasing knowledge of what gains access through the RAS, once threat is reduced, offers clues to strategies that promote attentive focus to lessons in school and at home. You can build novelty into teaching new information. Changes in voice, appearance, marking key points in color, variation in font size, hats, movement, lessons outdoors, music, curious photos, unexpected objects (a radish on each desk when students enter the classroom) get the RAS attentive to admit the accompanying sensory input of lessons that relates to the curious sensory input! Advertising a coming unit with curiosity provoking posters or adding clues or puzzle pieces each day invests curiosity as children predict what lesson might be coming and the RAS is primed to "select" the sensory input of that lesson when it is revealed. Playing a song when students enter the room can also promote curiosity; hence focus, if they know that there will be a link between some words in the song and something in the lesson. If a teacher, or parent helping with homework, walks backwards before a lesson about negative numbers, the RAS is primed by curiosity to follow along when a number line is unrolled on the floor to start instruction about negative numbers. Even a suspenseful pause in your speech before saying something particularly important builds anticipation as the students wonder what you will say or do next. Children Who Actually Get Excited When Asked, "What did you do in school today?" Recall how, as a child, you felt about radishes as garnish on your plate. Now, imagine walking into your childhood classroom and finding a radishs on all the desks. Students' RAS will be curious about this mundane object because it on THEIR desks in a classroom, and not on a dinner plate. Now their attention is alerted to the novelty and curiosity so the RAS admits sensory input "clues" to the puzzle of the novel object on their desks. They are engaged and motivated to discover the reason the radishes are there. Now they are attentive and their brains are engaged. 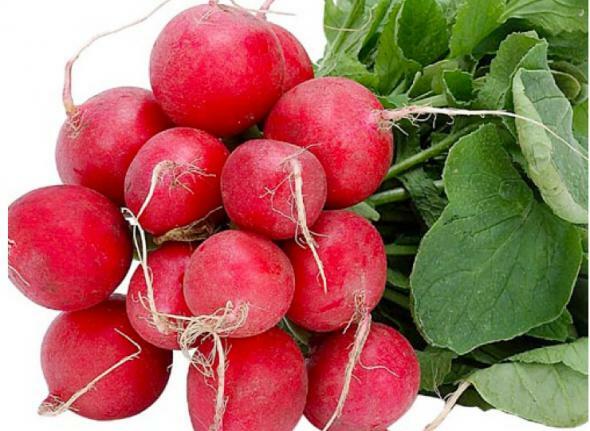 Younger students learning the names and characteristics of shapes might have the opportunity to develop a concept of roundness and evaluate what qualities make some radishes have greater "roundness" than others. The lesson for older students might address as analysis of similarities and differences. The RAS will respond to the color, novelty, peer interaction of evaluating these objects that are usually disdained when found in their salads as they develop their skill of observation, comparison, contrast, and even prediction as to why the radishes that seemed so similar at first, become unique as students become detectives using magnifying glasses. Students' stress levels remain low as they use their individual learning strengths to sketch, describe, or take notes about what the radishes in their group have in common and how the differ. As the survival tool, the RAS alerts to curiosity and remembers the resolution of the brain's prediction, as animals need to learn and repeat behaviors that are satisfying and fulfill survival needs, such as eating tasty food or following the scent of a potential mate. Engaged and focused brains are alert to sensory input that accompanies the pleasurable sensations. In animals these associations will make them more likely to find the source of pleasure in the future. As students enjoy the investigation with the radishes, the required lesson content can follow the open gateway to reach the higher, cognitive brain. 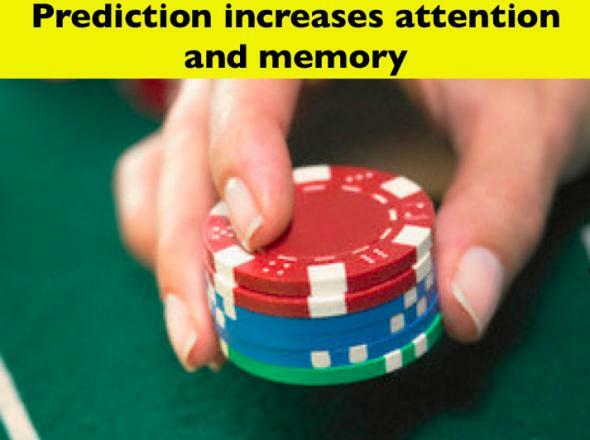 The novel experience of a simple radish, when used to promote curiosity and prediction, is likely to do more than carry the learning experiences into long-term memory. When children are asked that evening, "What did you learn in school today?" they will further strengthen the memory as they describe both the radish AND the day's lesson as grateful parents give the positive feedback of attentive listening. Can we assume this will work with adults? 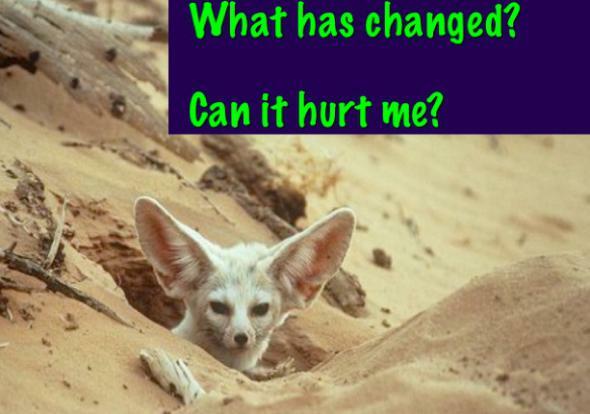 Judy - Great post! I have forwarded to all my teacher friends. I do a fair amount of corporate training and was wondering if you feel this is applicable to adults, as well. Thanks! I really enjoyed this article. I'm a junior in college attaining my bachelor's in Psychology so it was entertaining to learn about the Reticular Activity System and it's effects (I want to go to grad school for neuroscience). I would advise one more proof read perhaps, there were a handful of grammar mistakes and words left out - and while it really isn't a big deal, it does take a bit away. Thanks for these comments. Yes, the curiosity factor is present for the brain's attentive filter in animals, children, and throughout our lives - so when you want someone to really focus on what you say and do for learning purposes or other situations, from sales to talking to your teenagers who don't seem to "listen" or remember what you say. More about the topic of motivating with curiosity will be on my free ASCD.org Webinar "Ask Dr Judy" Series for educators, but free access to anyone. It will take place July 20, 3pm EST, and will then be placed in the ASCD.org archives also with free access. Thank your to my psych major reader for your very well taken advice to proof the piece again. I completely agree that grammar and spelling errors do detract from the impact of any written work, especially in the areas of science. I hope to revise soon and to those who read it before then, my apologies. I work for a tutoring company and I am so fortunate that our owner absolutely encourages us to use whatever means available to teach the children. We have curriculum but we do not have any scripted programs. Children have good days and bad days and being able to not "force-feed" them information really helps turn everyday into a good day! Thank you! I am going to subscribe to your blog and check out ours if you get a chance! We are just starting. Is Math-Free The Way to Be?